Edit - Successfully extracted the database and now it is running in IIS. However new problem. Since I am not very fluent in this language can you please elaborate my current error? Last edited by jbeitz107; 13-07-16 at 11:45 PM. sir how to translate this in english? do you how to translate? can some 1 tell me where to change all sql user n passwords ?? i find few but got no clue at all where they all are. I have error and i do same like you. can u tell me what i do wrong?? I got the game up and running. Thank you for your tutorial. How do I translate this? Last edited by Mhbays; 01-06-17 at 11:06 PM. what name this game on english version ? This is a very nice Which site is the site translation? Thank your sharing the game, but I got some problems with translating to English. 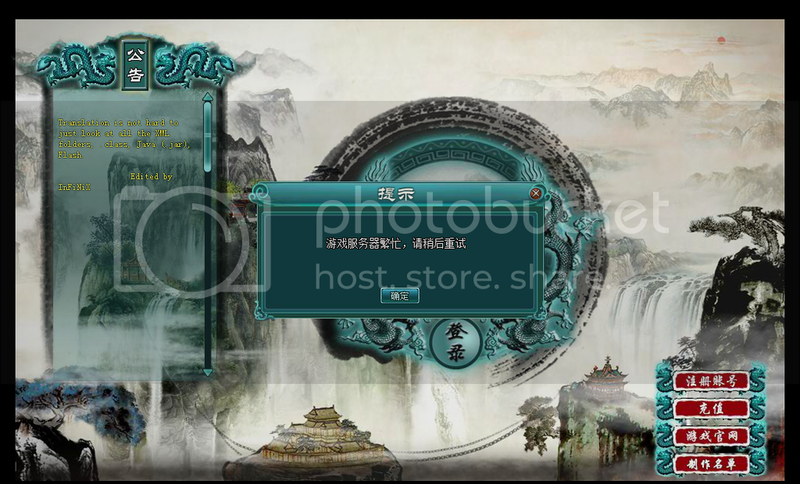 I check the client file and database as well, I can only see the CN & EN, but in game there are almost VN. where to change the IP and the sqll password how to create a database ? a database should be created!? When you extract file from DB to your mysql data, it means as your database has been created with the name 'xy', username='root', password = 'TugaShot'. For IP: check file db_sql.php in client folder & file config.xml & firstConfig.xml in folder data(in your client folder C:\xampp\htdocs\data). Does any got this error?